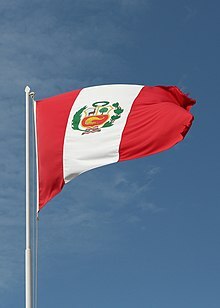 There are two separate meanings for the term of state flag in vexillology; either the flag of the government of a sovereign state, or the flag of an individual subnational state. In addition, some countries have state ensigns, separate flags for use by non-military government ships such as guard vessels. For example, government ships in the United Kingdom fly the Blue Ensign. State flags should not be confused with the national flag as used by military organisations; these are referred to as war flags and naval ensigns. The state flag of Massachusetts on display in the Financial District of Boston, Massachusetts. In Australia, Brazil, the United States, and some other federalized countries, the term state flag can have a different usage, as it frequently refers to an official flag of any of the individual states or territorial sub-divisions that make up the nation. ^ Znamierowski. "Government Flags". World Encyclopedia of Flags. p. 66. Znamierowski, Alfred (2002). The world encyclopedia of flags: The definitive guide to international flags, banners, standards and ensigns. London: Hermes House. ISBN 1-84309-042-2.